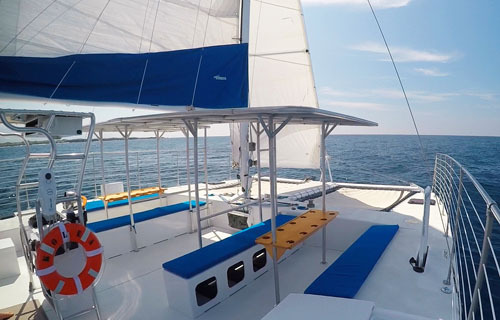 Have our beautiful sailing catamaran all to yourselves with a private catamaran charter. We set sail from Kailua Kona on the Big Island of Hawaii, about 30 minutes south of the Waikoloa Beach Resort area. Our private boat charters offer snorkeling, dolphin watching* (see notes below), whale watching, sailing lessons, or any combination that suits our guests. Guests can choose from one of our standard private sailing charters and book on-line, or give us a call to arrange a customized private charter tailored to their needs. Personalized private boat charters are available at the same prices as the charters above. Call us at (808) 883-0399 to make arrangements. Why choose Paradise Sailing Hawaii for your private boat charter? We pride ourselves on maintaining a well kept, clean and comfortable vessel. When comparing charter companies on the Big Island, we advise you to consider some of the often overlooked factors that can affect your experience on your private charter. Is there shade and is it big enough for more than just a few guests? Are there decent restroom facilities on board? Are there seat cushions or will you be sitting on hard fiberglass the whole time? Are there tables for your food or will you be holding your plate in your lap? Are there drink holders so you can safely set down your cocktail when you are tired of holding it? Can you easily move about the boat without having to crawl on you hands and knees? Being an owner operated small business, we strive to give our guests the best possible experience we can provide. Please read our reviews on Trip Advisor to find out how much others have enjoyed sailing with us! *Please note, for the protection of these beautiful creatures, we do not swim with wild dolphins. Click Here for more information.